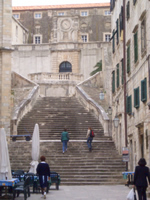 On the south side of the Gundulic Square a monumental Baroque staircase leads to the Poljana Ruđera Boškovića (Poljana (Croatian) - Plane; Square) where the Church of St Ignatius and Collegium Ragusinum, Dubrovnik's reputable Jesuit college, are located. 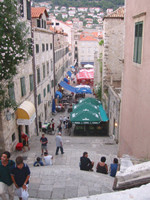 This urban complex many find to be the most representative Baroque example in Dubrovnik and the whole Croatian coast. Dissatisfied with numerous Italian scholars, Beccaddeli, the bishop of Dubrovnik, asked in 1555, to the newly founded Jesuit order to open a college in Dubrovnik. The idea was not realised until 1647 when the legacy of Marin Gundulić, a Jesuit from Dubrovnik, opened the door for the start of planning the project. In 1653, the Jesuit Rector Gianbattista Canauli made a project which was supposed to regulate the whole urban structure of the suburb in the oldest part of the City and provide space to build the Jesuit church and college. The project planned for demolishing a wide number of houses. The buy off had already started when the destruction of Great Earthquake of 1667 interrupted all work. The project had resumed at the close of the century, for which purpose, Iganzio Pozzo, renowned Jesuit architect and painter was called to the City in 1699. Pozzo had finalized the plans by 1703 and the construction of the church completed in 1725. The Church of St Ignatius is single nave, with side chapels and a semicircular divided apse, decorated by magnificent Baroque frescoes with scenes from life of St. Ignatius de Loyola painted by Gaetano Garcia. The frescoes fit perfectly in the ambiance of the church and at first sight they are simply breathtaking. 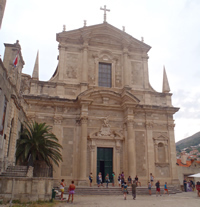 The church belfry houses the oldest bell in Dubrovnik, cast in 1355 by Viventius and his son Viator. At the right angle to the St. Ignatius church frontispiece, leans the Jesuit college building constructed according to the designs of Ranjina and Canali. With its neutral and hard lines the College building emphasizes the Baroque frontispiece of the church and the connected staircase leading towards the City centre. Designer of this fantastic looking Baroque staircase from 1738 is the Roman architect Pietro Passalacqua. The elegant staircase steps are built in a convex-concave form and are adding special visual effect to the whole complex and it seems as if the staircase mimics the feel of the famous Roman staircase which leads from Piazza di Spagna to church Trinità dei Monti. Dubrovnik - Did you Know? When looking at the St. Ignatius church frontispiece you will notice an empty space at spots where you would usually expect to see some statues. The reason why the space is empty is that the ship transporting the statues was lost at sea in a violent storm.